» How To Start A Fire Using Found Materials Outdoorsineering! When in the depths of the cruel and wonderful wilderness, there can be no more essential companion than a strong fire. A fire marks your campsite as your own, so that fellow travelers know to leave well enough alone and stay away. It provides light by which you may write poetry or do whittling. And it is often from the noble outdoorsman’s fire that the greatest of all of nature’s spectacles, the Forest Fire, emerges1. But it is entirely possible to find oneself in the wilderness bereft of the means to start such a fire. Perhaps a raccoon has pilfered your torch and lighter. Perhaps you misplaced your supplies or had to bargain them away to get out of a sticky situation, possibly involving pirates. Or perhaps you are a true outdoorsineer and are attempting to conquer the wilds with nothing but wit, skill, and pluck. Whatever the reason, the result is the same: you are going to have to make a fire using only what lies around you. Take in your surroundings. What you see will be important, as there are many strategies that you can attempt, depending on where you are. What do you see? If you are surrounded by lava, then you are in luck! Starting a fire is going to be a relatively painless process for you2. Gather whatever kindling you can find and arrange it in a pile formation of your choosing. This can be wood, dry leaves, clothing, or almost anything else. Lava will burn anything so discretion is not altogether important here, though it would be advisable not to plan on burning key food items, expensive equipment, or your map. Find the longest piece of your kindling and simply dip it in the lava. Unless it is composed of some heretofore-unknown material such as unburninite, your kindling should catch fire — even if your kindling is a rock, and if you are using a rock as kindling it is the opinion of the author that you are intentionally trying to do it wrong. Be cautious that your kindling does not disintegrate from overheating, and that you do not drip hot lava onto your arm. Now make your way back to your pile and set it ablaze. Congratulations! You have made a fire. Of course, you are surrounded by fire – molten, running fire. It is strange that making a fire was a priority for you here, but your reasons are your own. If you are near a fire, then this is going to be your best bet for starting a fire of your own. The original “source” fire may be large or small, but this is of no matter. It is fire’s peculiar nature that it can spread and grow irregardless of its original state3. Thus we will refer to the process you are going through here as “stealing” fire but in truth there is no ethical dilemma to work out, for this is a victimless crime. The exact process of stealing the fire is very similar to the process of starting a fire with lava, but you are going to have to watch out for smoke inhalation. Fire can spew a toxic chemical known colloquially as “smoke” (native Outlandians called it “fire stink” and feared it as a god). Draw your shirt up over your face as you approach the fire, so that the top of your shirt makes a seal over your nose. The effect will be that you are some sort of freak with no neck or lower face, with only the top half of your head protruding from the collar of your shirt, like an egg-shaped man. This position is known as the “Safety Seal” and it is a very important thing to know, as the fabric of your shirt will prevent any miniscule invaders such as smoke germs to enter your respiratory system and work their foul deeds4. The Safety Seal can seem complicated but it is an important thing to master and thus it is recommended that you practice it in a mirror at home before you go. Note that heavy outdoors-type fabrics such as denim or burlap will guard you especially well against danger while lighter cloth such as lace or a mesh shirt will not do as much. Things are getting more challenging now. You will still be able to build a fire even if you do not see either lava or fire around you. Your next priority is to look for hot coals. Hot coals are found in the wake of a fire, and in fact are a final attempt by the fire to cling to life and resurrect itself. If you can find a pile of hot coals, you will simply need to place them under a small pile of kindling and the fire will rise up again for you to enjoy. Good places to look for hot coals are in the wreckage of a burned-down building, in a barbecue pit, or in the belly of a dragon, if they exist. Unlikely places to search for hot coals include underwater, in the air, or in a pile of cold coals. If lava, a fire, or hot coals are not immediately available, do not panic. Another feature of the wilderness that can be twisted to your advantage is the abandoned lighter. Abandoned lighters come in many colors and varieties, and they can turn up in almost any environment, so be ever vigilant. Abandoned lighters can be hidden in tree stumps, under dirt, and in abandoned backpacks. Some experts conclude that when you are in the wilderness, you are never more than twenty feet from an abandoned lighter, a thought that has given many a traveler pause. You will be able to start your fire by holding the abandoned lighter to some dry wood or similar kindling and flicking the fire-starter metal part of it5. If the lighter still has fuel, a small flame will ignite (caution: this is not your desired flame, only a means to an end!) and you will be able to start your fire. If the lighter does not have fuel, you will have to search for another means to start your fire, but at least you have solved the mystery of why a perfectly good lighter was abandoned in the first place. A form of fungus, matches are notable for their thin, sticklike bottom halves and their bulbous, red tops. When flicked against a rough surface, they ignite in a small fiery blaze, which is thought to be the propulsion mechanism for the match’s spores. Matches grow in the dark and can often be found under mulch or on the belly of a fallen log, along with much of its fungal kin such as the mushroom and the slime bug. If you are going to start a fire using matches, you ought to gather a small group of them, say around twelve. If you are lucky you may find such a cluster growing together in a formation known as a “matchbook”. Lighting a matchbook all at once produces a considerably larger flame than a single match, and even if you only need to light one match at a time, you can still use the matchbook as a small writing pad, good in a pinch for jotting down a telephone number discovered on the trail, or the name of a favorite bar6. If, upon examination of your surroundings, none of these things are available to you, then unfortunately you may be out of luck. Robert Raccoon needs to build a fire! He has also been transformed into a human-raccoon hybrid by an angry wizard, but there is nothing we can do about that. So help Robert by picking out the three objects around him that can give me what he wants. 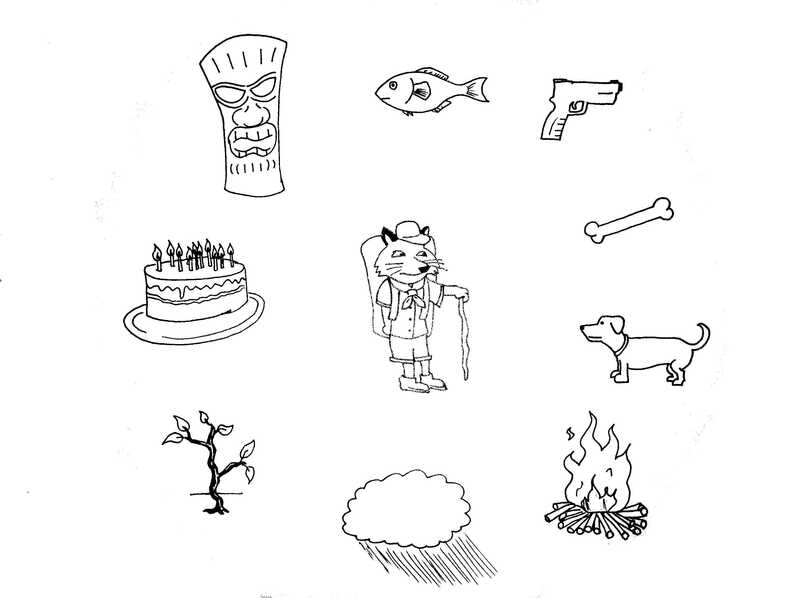 Answers: The birthday cake, bonfire, and gun can give him what he wants. The birthday cake and bonfire are both sources of fire and the gun can provide sweet release from Robert’s humanimal hell.